Likely, your garage is full of sports equipment, garden tools, and other items that won’t fit in the house. But you might have another problem on your hands as a result. Struggling to find space to park your car can be one of them.Yet, you can reclaim your garage space with these five DIY overhead garage storage ideas. Save the headaches and focus on showing off your garage with these adjustments! Garage storage shelves provide many options for customizing your garage. A wall-mounted shelf can do wonders for your floor space as well as organizing any clutter that may have built up over time. Depending on the type and size you choose for your garage, garage storage shelves can take up a lot of space. Consider using the underside of shelf space in addition to the shelf’s top surface. You might be overlooking the perfect place to store loose items lying around. Buy some heavy duty glass jars with screw on lids. Fasten the jar lids onto the bottom of your shelf with a screw. You can then fill the jars with nails, screws, and washers. Screw the filled jars back onto the lids to store these small items while saving storage space. With these, you’re giving your garage a much-needed facelift in looks and organization. 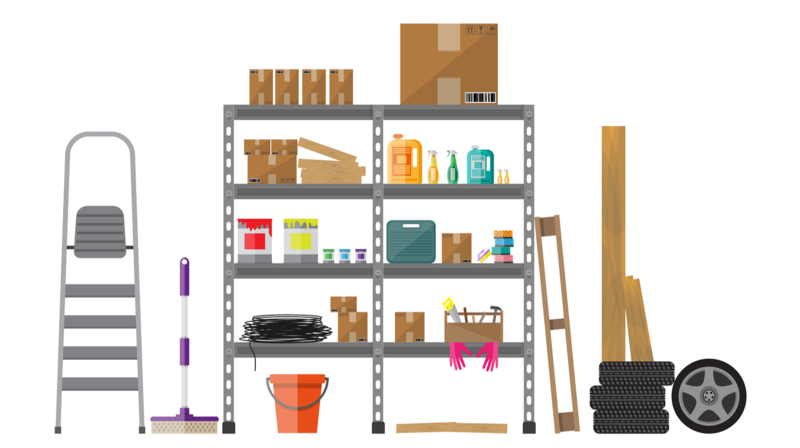 Change your garage’s shelf material and look to add your personality to your garage’s look. 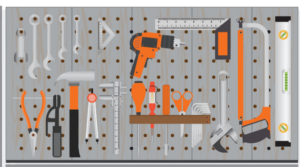 Use the walls of your garage as a tool storage space by installing a pegboard that you can use to hang up your tools. Improve your organization more by drawing an outline around each tool onto the board. You can see which ones are missing from your collection and replace them on the board. As an amazing organization tool, it’s also a great way to add personality to your garage. Choose which type of pegboard would suit your garage’s look. Part of what makes DIY ideas work for garage storage is providing homeowners with many ways to customize how their garage works. Choose the board’s size. Or look at choosing which pegboard material would suit your garage. There are many ways to customize your pegboard. Have it carry the essentials, your garage tools, as well as having it carry miscellaneous items to get even more use out of it. If you’re tired of bikes cluttering up your garage, hang them on the walls to keep them out of the way. You can buy bike hangers that are easy to install on the walls of your garage or construct your own from nails and plywood. Be sure to install any hooks or hanging device by attaching them to the studs in your garage walls. Though you can also store bikes by hanging them from the ceiling, it becomes much more difficult to reach up and remove them regularly. Have a bike you’re proud to own? Look for a bike storage rack with a stylish look and consider the best place to fit your bike before adding it to your garage. 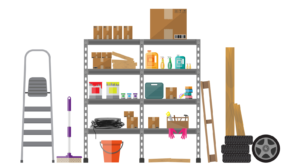 Do you have garage clutter that you would prefer not to see every day? Make your garage look tidier by installing garage cabinets. Garage storage cabinets can be used to store a wide range of items, including tools, sporting equipment, and gardening accessories. Give your garage a slicker look by getting a garage storage cabinet with the right material for your garage. Keeping the cabinet organized is ideal, but they come with the added benefit of an easy tidy-up look. When you want to be free from clutter, simply close the cabinet doors and enjoy the look of your well-organized garage. Use garage storage cabinets for excess garage tools, fragile items, or items you’d prefer not to be reachable for children. Once you’ve filled up all the walls and the floor space of your garage, there’s only one place left to store your stuff: the ceiling. You can build your own sliding garage storage solutions by installing sliders on the garage ceiling, into which you can slip some plastic storage boxes or reinforced fabric totes. Fill these overhead containers with the items you don’t have space to store anywhere else. Plus, overhead garage door storage has the benefit of taking up what would otherwise be “dead space.” Your garage door leaves a gap between itself and the ceiling when in an open position, but now you’ve maximized that space to keep your garage clutter free! If you’re looking to optimize your garage’s look even further, get in touch with Hill Country Overhead Door to learn more about our beautiful selection of custom garage doors. We want to help you get the best-looking door onto your garage so you can enjoy it inside and out!